I was given two grabbers while in the hospital. They are good, but they don't open wide. I have one grabber from 'before' my accident. It has a wooden handle and opens wide,...wide enough to pick up a jar,...so it's held a position of honor in my kitchen, especially during the time since I got home from the nursing home two years ago. Well, a few days ago, the edges of the main rivet of my best grabber disappeared causing the rivet to drop out and my chariot to turn into a pumpkin. Disaster. 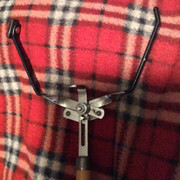 My proud, beloved grabber looked like a jumble of flopping pieces of metal with no order or direction. I wondered briefly if I would ever figure out how to put it back together. Happily, that one main rivet was the only thing missing. A few minutes later, I'd figured it out and replaced the rivet with a twisty-tie to hold it together, awaiting repair. Tonight, I found a metal screw, some washers, and some nuts, and repaired that favorite grabber. I'd bought that grabber at The Container Store about 15 years ago. In recent years I'd tried to find another one, but they didn't have anything like it. All they had (when I searched before my accident) were wimpy ones with very little clearance between the pinchers. So, I'm really happy that I could save this one. I also have one good grabber and a crappy grabber. doing something good for yourself and repairing is always an uplifting event. my power shaver broke the other day, actually my ex took it apart to clean and couldn't figure out how to put it back together. I was getting awfully hairy so I had to put back together myself and I did with one hand and it works good, I am absolutely amazing.